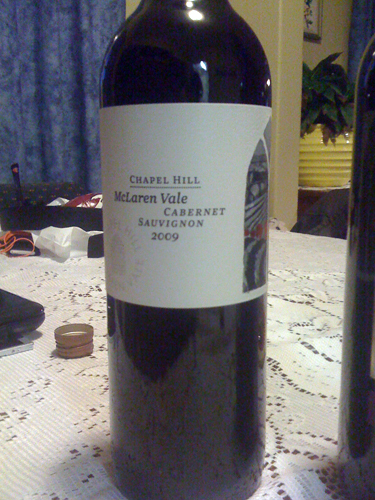 2009 was a tricky vintage in McLaren Vale, with that veraison heatwave really drying things out (and Cabernet seemed to particularly suffer). Still, when you put most 2009 McLaren Vale reds next to their 2008 and 2007 counterparts it’s the 09’s that win. Until the glorious 2010 reds come out that is (seriously, get excited)…. What I like about this is just how Cabernetish it is – I’m genuinely excited to see some nice varietal character in here, albeit cast quite ripely. There’s that whiff of pencil shavings fruit/oak combo, a real classic Cabernet aroma that I rather enjoy. That HB smell sits alongside full choc berry pie fruit, a hint of mint leaves and a little condensed milk oak. It’s a fullish nose, a little confected around the edges perhaps but certainly quite substantial. The palate too is welcomingly run by tannins – tight, gritty tannins – sliced with very high quality vanillan oak and some warmer, sweeter berries, tending confected again around the pointy bits. No desiccation in there though and the line through the finish is fresh and pure.